Close to 100 million Americans have chronic headaches. Nearly 40 million of them have migraines. And the majority of migraine sufferers are women. In fact, the World Health Organization suggests 20 percent of all women suffer from migraines (compared to only 8 percent of men). 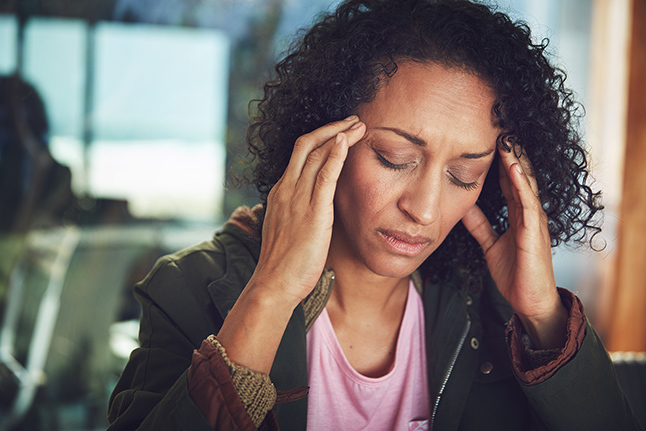 “Migraine is the third-most common of all disorders on the planet, and it is the second-leading cause of time spent disabled over a lifetime, yet its mechanisms have been misunderstood and its consequences have been greatly underestimated,” says Andrew Charles, MD, a UCLA neurologist who is widely recognized as a leader in the field of migraine research. Until just recently, migraine was considered a vascular disorder. It was only by chance that current migraine therapies — for seizures, depression and high blood pressure — were found to provide benefits to sufferers. Now, research has shed light on what is actually causing migraines. Scientists like Dr. Charles believe fluctuations in brain chemicals and abnormal electrical activity of the brain regions are a likely cause. Brain scans of patients in the midst of a migraine show they experience waves of abnormal activity on the surface of the brain. Armed with this information, researchers are looking at ways to reduce or short-circuit abnormal brain activity before symptoms begin. Dr. Charles has found promising results from a drug used to treat confusion in patients with Alzheimer’s disease. The medication seems to inhibit the brain activity that may be triggering migraines. Another breakthrough treatment is the use of monoclonal antibodies. These are molecules that target and bind to proteins released by the brain during the initial phase of a migraine attack. These treatments are the first to be developed specifically for migraine and are meant to be preventive. The U.S. Food and Drug Administration (FDA) approved one monoclonal antibody treatment in May 2018. Similar medicines are close to receiving FDA approval. Many migraine experts consider monoclonal antibodies to be “game changers” for the field of migraine relief. The UCLA Goldberg Migraine Program uses leading-edge research and medicine to treat migraine sufferers. To make an appointment, call 310-794-1195.